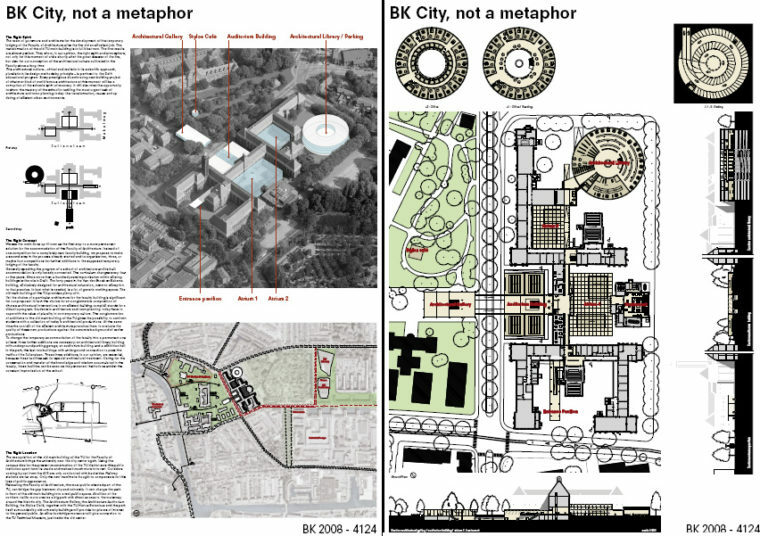 This entry, like a number of other proposals, including BK City, not a Metaphor, departs from the existing university building on the Julianalaan that currently serves as the architecture faculty. Even though the Julianalaan building is intended as a temporary solution, the proposal for the faculty to remain at this site and invest in improving its facilities should be seriously considered. Indeed, instead of building a totally new structure, starting from the existing situation could be a wise strategy in these times of economic and ecological crisis. The idea of re-use could also then be seen as a statement made by the university to re-value and improve historical campus buildings, and thus enhance sustainability. amalgam proposes to extend the Julianalaan building, combining the orthogonal geometry of the existing building with an expressive new architecture. The new parts are very carefully positioned, delicately establishing a relation with the existing building. The programmatic organisation is clear and, by avoiding dead ends and disorientation, helps to overcome the labyrinth-like character of the existing building. This is achieved by organising all public functions along a street, and by positioning the studio spaces and offices in the transversal wings. The street functions like a backbone, providing possibilities for interaction through public facilities, presentation and exhibition. The density that comes with enlarging the existing premises is dealt with through the use of patios, which provide daylight and outdoor spaces. The jury regards amalgam as by far the most convincing of the entries that proposed using the Julianalaan building as a permanent solution. amalgam presents a clear, well-argued vision of the faculty of the future, and also offers a feasible design solution that convincingly shows that a combination of re-use and new construction can result in a strong architectural identity, which is fitting for an internationally renowned and innovative architecture faculty. This proposal takes a courageous position in complementing the existing building with an architecturally strong counterpart. The jury awards amalgam the highest possible marks. This proposal combines a greenhouse typology with a dynamic laboratory atmosphere. 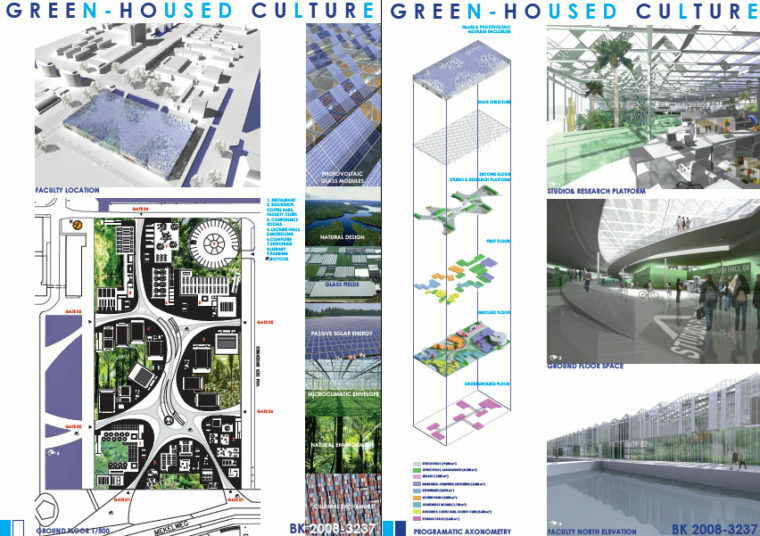 The greenhouse is not only an interesting spatial and climatological typology, but it also refers to a local characteristic: the Westland area greenhouses in the immediate vicinity of Delft, while simultaneously evoking large university laboratories. The proposal moreover offers a clear statement on sustainability, without exaggerating the architectural expression that often accompanies it. The production of energy by photovoltaic cells, the use of rainwater, the function of patios as vents, and the way the structure allows for a controlled atmosphere, are all convincingly integrated in the design. The design indeed shows an integrated approach, in which sustainability, issues of daylight, energy and waste are naturally combined with social structures, routing and spatial qualities. In providing a large, continuous public space, the social aspect of the faculty is taken very seriously, with a good, clear routing provided in an otherwise dynamic open space. A positive point is also its openness towards all sides, allowing relationships to be established with other parts of the campus. On the level above this large open space, a second platform provides a research and studio environment. Despite the low-rise and low-tech expression, the architectural design does provide a good image of the dynamics and innovative capacity of the university. The main space seems extremely inviting to all types of people, students as well as researchers and international guests. Placing the green, park-like spaces at the edges of the building, rather than conceiving them as central patios as one would expect, is a remarkable and very effective design decision. The scheme is clear and leaves enough flexibility for further elaboration in the next phase. 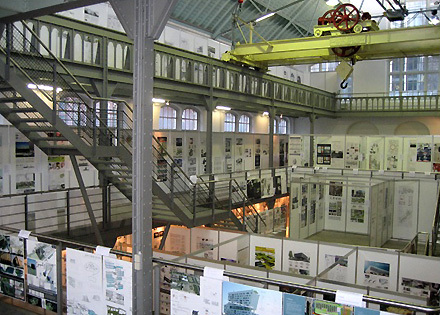 The jury remarks that the materiality and detailing need specific attention, however, as there could be a risk for a too generic exhibition hall character. For its integrated vision on educational, architectural and sustainable demands, as well as for its feasible design solutions, the jury awards GREEN-HOUSED CULTURE the highest possible marks. This proposal looks back to existing projects and typologies, while proposing to literally use the Rotterdam shopping street Lijnbaan, which was designed by architect J.H. van den Broek in 1952. This street, measuring 500x50x5 metres, is projected onto the Mekelweg. The Mekelpark's programmatic void thus becomes filled with activities. This radical move results in an intriguing project, which is finely tuned into a building that can engage in different relationships with the street. While referring to Van den Broek, the images also strongly recall the projects of Superstudio. The accompanying text clearly states that the project is not new. This is a controversial and daring position, questioning the position of the architect and of architecture today. While clearly evoking the memory of Dutch architecture, A WORLD WITHOUT OBJECTS has strong architectural qualities in and of itself. The first panel, which at first sight attracts the most attention, presents an image of silence that the jury finds beautiful. The jury does wonder if this silence is really something to strive for, since for a street to work something must happen on that line. Somehow, the silent image bears a promise that something will happen, as much as it offers a sense of freedom. On the second panel, the sections and fragments of the plan prove the possible spatial richness of the proposal. The structure offers freedom to develop, by providing a diversity of educational spaces along the street, such as lecture halls, studios, rooms for study and reading, but also for more social functions, such as a bar, restaurant and sports facilities. Despite the suggested freedom, the proposed spaces are far from neutral. The sketches show a spatial richness that is achieved by minor means, such as the use of roof lights and the different height levels of the various spaces. The library is designed as the only exception in the scheme: a 24-storey high triangular tower. In some places, bridges, connecting the two sides of the campus, traverse the street. The jury is intrigued by this remarkable project and challenged by its provocative architectural statement. While thus providing fuel for architectural debate, the proposal is considered highly convincing in terms of the spatial qualities and richness in use that this project suggests. The jury awards A WORLD WITHOUT OBJECTS the highest possible marks. This project, like a number of others, takes the street as a typology that allows for and generates encounters between people. Indeed, the architecture faculty's social aspect is seen as the driver for the project. 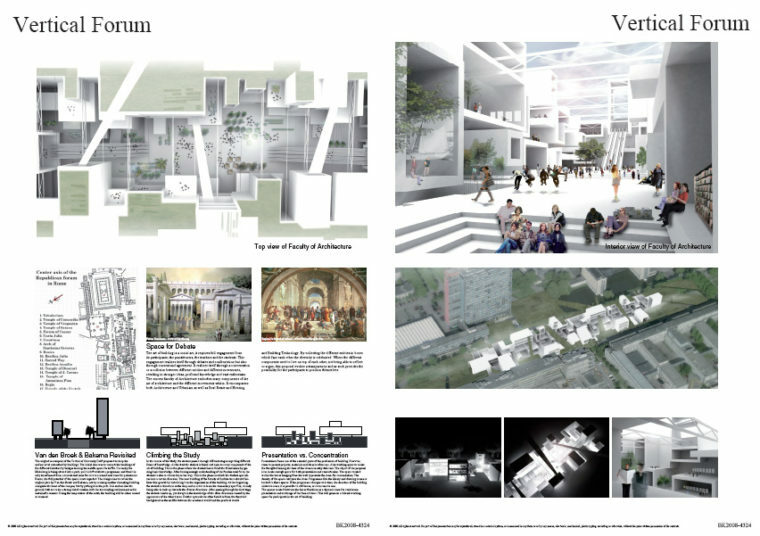 The proposal refers to the Roman Forum as a place to meet and exchange: the faculty of architecture is seen as a place for debate. The various departments within the faculty are each given their own position, while mutual exchange is stimulated. Moreover, the proposal includes a critique on the current use of the Mekelweg. According to the designers of Vertical Forum, the Mekelweg has more potential than just being a transitional zone without programme. Instead of adding another volume to the series of faculty buildings situated along the Mekelweg, this design proposes a building sunken into the park. This offers sustainable heating and cooling solutions, and, moreover, generates more activity on the campus. 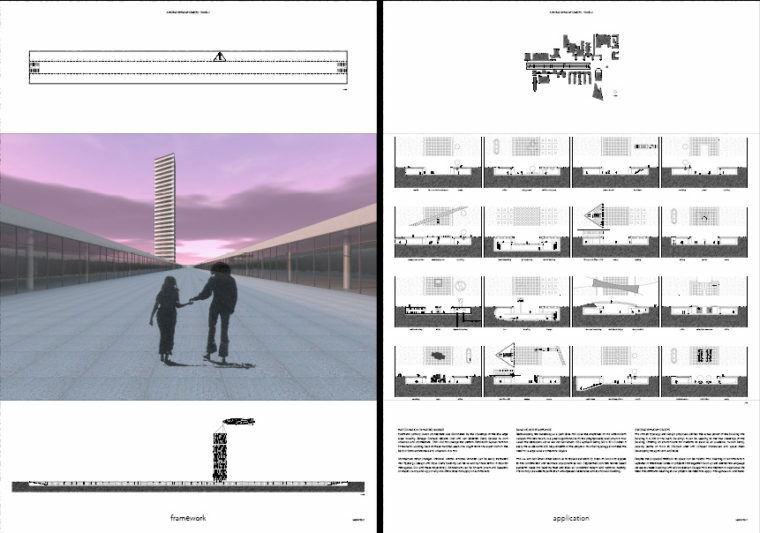 The proposal also provides a radically new structure for Bouwkunde, in which presentation and concentration are seen as key activities in a faculty of architecture. The spaces in between rooms for concentration therefore offer a dynamic zone for continuous presentation and exchange of ideas'. The jury wonders however if this clearly defined organisation leaves enough space for free thinking and creativity? The graphic representation shows a chaotic, yet at the same time very inviting space, full of activity. The project clearly presents a vision and is well elaborated. According to the jury, Vertical Forum offers a remarkably inspiring and critical view of architectural education, as well as of the position of Bouwkunde on the Delft University of Technology campus. This entry attracted already in the first round attention through its rural character. It claims to be inspired by the European rural milieu. Whereas most entries present an idea of the Faculty of Bouwkunde as an urban environment, this proposal takes a reverse position. This is a refreshing approach, actually acknowledging the peripheral, suburban position of the TU Delft campus. Indeed, many tasks of contemporary and future architects might even be situated in such suburban conditions. Meanwhile, the jury finds the architectural expression surprising for this function, with prototypical small houses that seem to give a totally different impression than that of an internationally renowned institute. The architectural concept is based on two levels: learning and creating. Learning takes place in a diversity of facilities on the ground floor, that can be seem as a continuous landscape. The separate houses are meant as private offices and studio spaces in which processes of creating take place. Technically, the proposal is well elaborated, taking into account construction, materiality, sustainable solutions and the phases of the building process. For the jury, the village-like image raises discussion. Can Bouwkunde afford a provincial expression or should it provide an answer to the urban ambitions of Delft University of Technology? While the scheme might suffer from its fragmented character, a good balance between fragmentation and hierarchy can be achieved. In fact, the non-hierarchical spatial organisation of the project provides very interesting spaces. The use of gardens is a subtle and attractive way of organising various activities. The design provides a stage for activities, rather than a strictly defined architectural form. This stage allows embracing future possibilities; it provides a flexibility to add different elements. The jury concludes that this is a very strong concept, with modesty in the message. The project BK City, not a metaphor starts by praising the faculty relocation work done after the fire, stating that the process was critical and realistic in its scientific approach, pluralistic in its design methods. The designers see this as a quality that deserves to be continued. The project proposes a strategy for gradually extending the current Bouwkunde site at Julianalaan by means of competitions. The designers also take into account the time such an extension process would take, and present a strategy that distinguishes the various phases. The entry displays a no-nonsense approach, which could be highly feasible in both economic and ecological terms. The graphic representation of possible solutions however does not totally succeed in illustrating the architectural richness that could result from this strategy, in which the value of plurality is brought forward. Could this model of various extensions result in a coherent ensemble? Does the drawn geometry allow for a dynamic interplay between the existing building and future extensions? 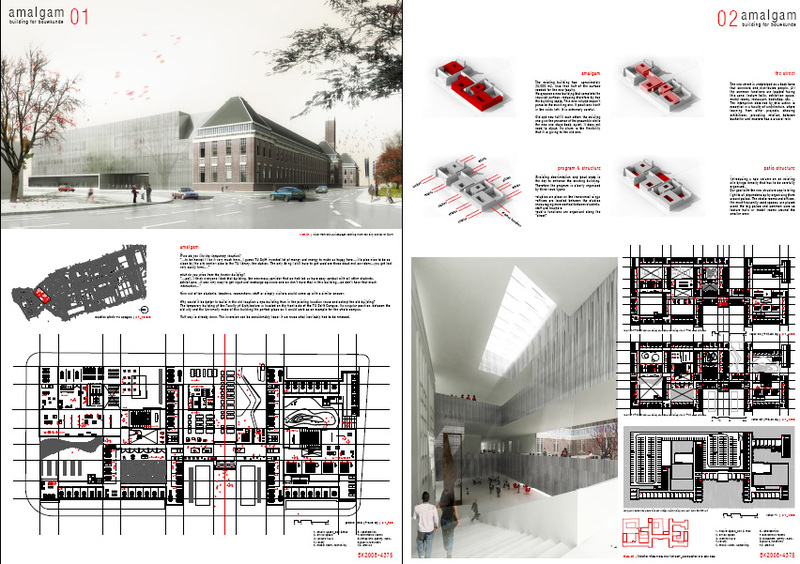 The appreciation of the current faculty building on the Julianalaan and the realistic approach to departing from that situation is well understood by the jury. BK City, not a metaphor convincingly shows that this is a realistic option, which the faculty and university should seriously consider. The statement is well thought through and clearly formulated, taking into account both the architectural and urban scale. This proposal is highly appreciated for its important statement and strategic quality. In combining a sustainable approach with an idea of flexibility in education, this entry takes a radical stance toward ideological concepts for architecture schools, claiming that such examples (Bauhaus, and perhaps also the old Bouwkunde) are too dogmatic. Instead, Ego Eco-system focuses on the need for change and growth in a flexible building concept that stimulates transformation…. This idea of change and transformation is linked to the metaphor of a living organism, developing through its intrinsic relations, with the operating performances occurring within the structure. 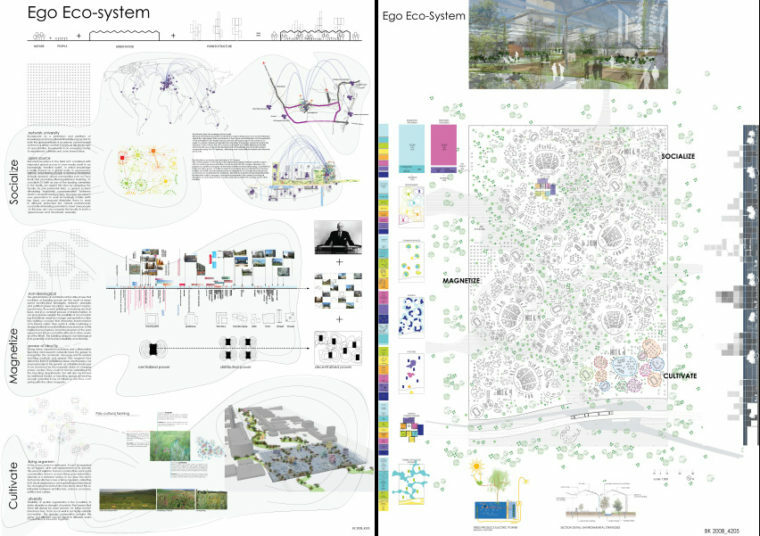 The design proposal merely focuses on the plan, whereas the project's spatial potential could have been expressed in a more detailed section. The plan's radical openness offers a challenging starting point, though the jury wonders if such a scheme would provide enough orientation. In order to function as a real study and work environment, it might need some clear points of recognition that structure the perception of the space. Indeed, the open plan, in which very dense and dynamic activity is suggested, is provocative and raises discussion about flexibility, rather than ideology, as a key factor in the design of a school of architecture. Meanwhile, contemporary society, in which networks play an increasingly important role, is also taken into account. The proposal thus succeeds in combining the various criteria. Owing to this entry's daring and well-argued position, the jury rewards Ego Eco-system with an honourable mention. The entry, POST IGNEM (or After the fire), leaves the footprint of the old Bouwkunde literally untouched, and instead re-invents it as a spatially interesting inner courtyard within a new structure. This new structure is composed in a very rigid, systematic manner by defining a number of simple architectural rules. Although the proposal does not contain any novelties in terms of sustainable techniques, it is very carefully thought through on this level. The patios allow for natural lightening and ventilation, the large roof can be used to gain solar energy, and the ground plan allows for flexibility of use. The jury regards this project as a very thoughtful way of using the footprint of the old building as a tangible memory. The old Bouwkunde becomes a monument through its absence and presence in the new. This very intelligent proposal overcomes the risk of becoming too nostalgic through the architectural elaboration of the plan, which juxtaposes regular, small courtyards and the larger footprint courtyard. While the spatial representation remains rather limited, the concept itself bears the promise of a spatially rich building.The jury appreciates this project for its strong appeal to the memory of the old building, without falling into the trap of nostalgia. For this strong and simultaneously modest design proposal, the jury rewards POST IGNEM with an honourable mention. When, after the final decision, the names of the contributors were revealed, the jury was pleasantly surprised, for among the winners were many young architects and even students. 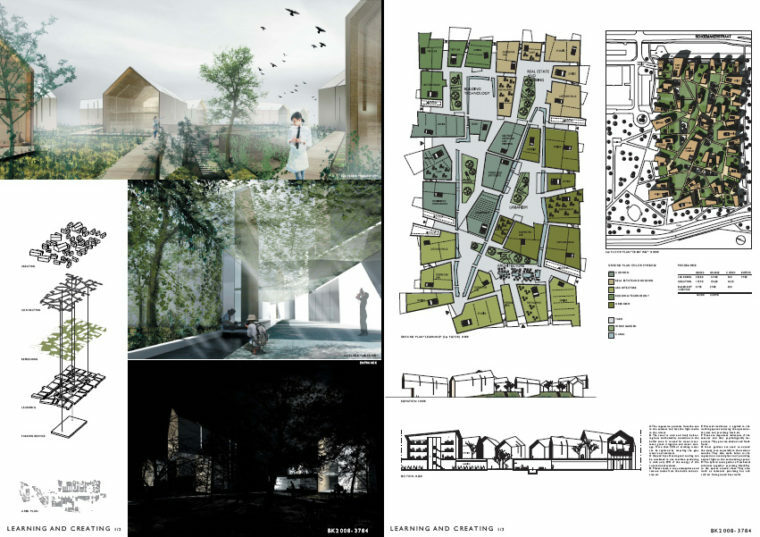 While the majority of the winning entries was by architects from The Netherlands, architects and students from Belgium, France and Finland were also awarded a prize or honourable mention in this competition. 466 entries were judged, januari 14 and 15 2009. After a full day of reviewing this mountain of ideas, 50 entries were selected for a second round, in addition to 16 entries specifically mentioned as valuable entries in terms of themes and ideas they address. As a final step in the procedure, each jury member voted for five projects, without any ranking. The entries with the most votes or with convincingly argued votes are thus nominated to receive the prizes and honourable mentions. Six projects (the first and second prizes winners) received a remarkeable high number of votes. Two (the honourable mentions) were added because they raised so much discussion that the jury decides that they also deserve to continue into the last round. The full juryreport, (and probably documentation on the other entries) will be available on the Building for Bouwkunde website soon. On this website also the full program, history of the old faculty building, texts to enghance the discussion and more.